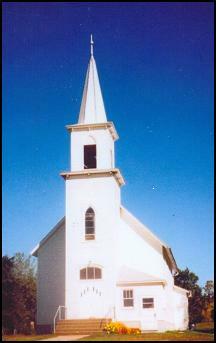 The East Moe Lutheran Church was built in 1882 just west of Garfield on land donated by Hans Pederson. On September 3, 1882 , the first worship service was held in the new church. A meeting was held on May 28, 1886 for the purpose of organizing the church as Ostre Moe ( East Moe ) and for electing officers. At that time, there were 172 members of the congregation. At the present time, there are 58 confirmed members of the congregation. Time, culture and the economy have taken their toll and some members have moved from the area. However, what was begun here in 1886 cannot be erased, for the sons and the daughters of east Moe have taken their God and their Faith with them to their new locations. Since East Moe Church was founded, 20 pastors have served the congregation. Visitors and new members are always welcome at East Moe .